I took a y67 DNA test in Jun 2016, upgraded it to y111 in Dec 2017, and took the Big Y test in 2017 as well. 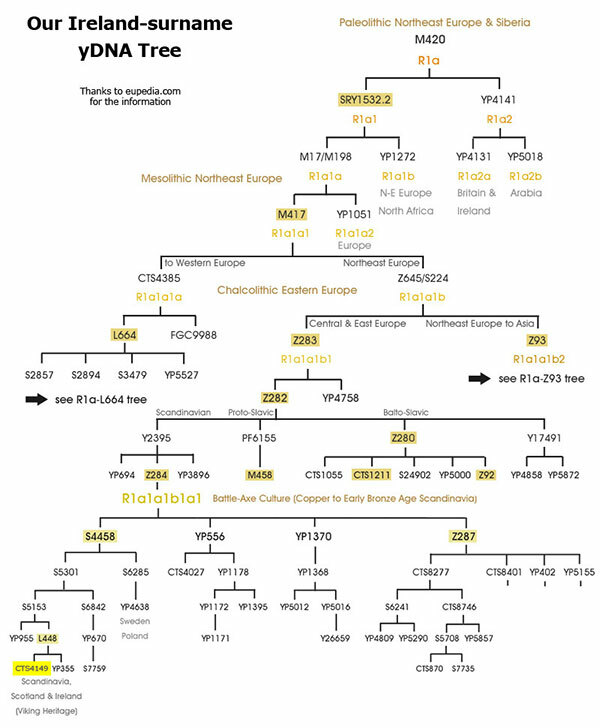 Our family's yDNA haplogroup is R-YP5640, a relatively recent R1a subclade that falls under the Scandinavian Z284 and CTS4179 subclades - and under R-S6353 of NW England, Scotland, and Northern Ireland. Unlike autosomal DNA tests such as AncestryDNA where every family member tested (except for a child) provides new information, yDNA tests out to the second cousin level or so are usually almost identical. Additional yDNA tests become very useful when the connections between more extended families are unknown or unclear. I'm currently working with my Wallace Ireland-descendant cousin to encourage him to upgrade his y25 test; he appears receptive to the idea. His upgrade to y37, y67 or y111 may tell us a great deal more about how closely his family is related to ours. Y-chromosome DNA tests provide deep historical insight into a single paternal line: from son to father - to father's father - to father's grandfather - and so on, back for tens of thousands of years. The Y-chromosome is never diluted by mixing with another line, because any son has only one father. From time to time, a mutation occurs on the Y chromosome. That mutation is passed on from father to future descendants - and is not passed on to anyone except those descendants. Over hundreds or thousands of years, the Y chromosome slowly diverges between ancestral lines as some members of a family inherit a series of mutations and others do not. As more time passes, these separate family branches continue to each mutate differently. A haplogroup is a genetic population group of people who share a common ancestor. Each time a mutation occurs, descendants who inherit the mutation are assigned a new haplogroup, which is a subclade of the original haplogroup. If enough descendants from the different branches have tested, scientists are able to determine which mutations occurred first - and estimate the time to the most recent common ancestor. a y-111 test - resulting in one exact y-25 DNA match to an Ireland-surname descendant of Wallace Ireland (the Allegheny Co PA line). Interestingly, my match had been waiting TEN YEARS for his first close match. Family Tree DNA (FTDNA) estimated that my Haplogroup was R-M198 (an R-1A subclade). 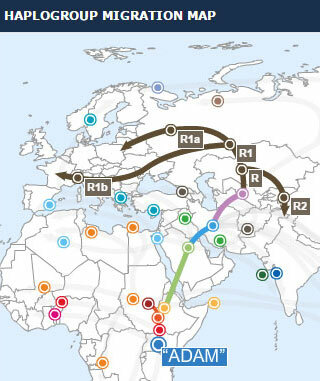 As everyone should, I joined my haplogroup project at FTDNA, R1a. They predicted that my haplogroup was R-S6355. I took the R-S6355 SNP test to confirm their projection; they were correct. In August 2017, FTDNA held a major sale on their Big Y test. That test refined my test results one further step to R-YP540..
What was our ancestral path from Africa to America? One of the main goals of taking the "Big Y" test was to narrow down my paternal line's historical migration path. Eupedia.com provides some of the best explanations about likely migration paths that I've found. Our understanding of the evolution of man has exploded in recent years, in large part due to the advent of affordable yDNA and mtDNA testing. Every new (and old) discovery of fossil remains undergoes intense scrutiny to determine what it tells us. Although we now know more than ever, scientists still base their theories on a small amount of data. What this means: any time my family members meet someone else with the surname Ireland, it's highly unlikely that we're related to them. The charts and images on this page are based on copyrighted material owned by Eupedia.com. They are presented here in a non-commercial manner as allowed under the Fair Use provision of U.S. copyright law.